Get out and get working as a quizmaster. Pubs need entertainment, you need money! Read all about how to do it. Written by a professional quizmaster of 20 years standing, the famous Dr Paul. What can becoming a Pub Quizmaster do for me? 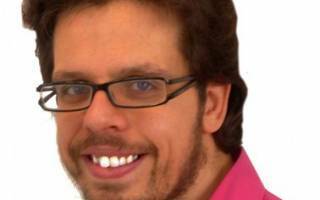 Am I suited to becoming a Quizmaster? What's actually in the book? Is there any bonus material that comes with the book? FAQs - Is this really for me? Quizmaster: Is That Really A Job? QUESTION: So how do you get work as quizmaster? ANSWER: You have to go and get the work yourself. My book shows you how. Many quizmasters run a local quiz once a week or once a month, mainly for their own pleasure and sometimes for beer, and that's great but there is a niche for those who want to take it seriously and make proper money doing a job they love. I am one of those people who takes it seriously. My first paid gigs were in 1996 and by 2000 I was quizmastering full time and have been doing it ever since. 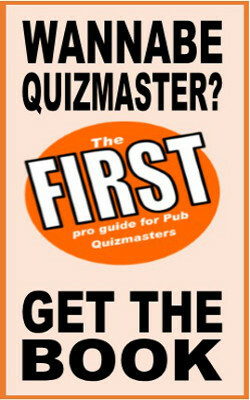 Being a Pub Quizmaster is a huge amount of fun and, if you know where to look, can be well paid. I love going out to work! 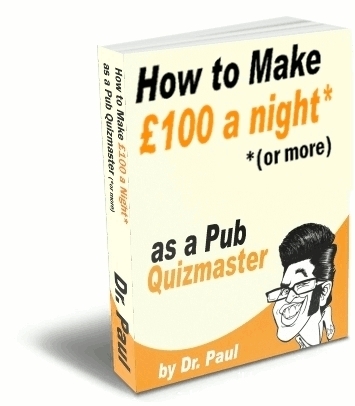 My book, How to Make £100 a Night Or More as a Pub Quiz Quizmaster will show you the easy way to get started. 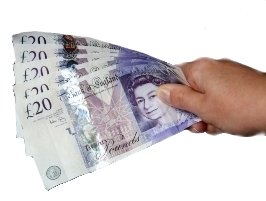 You can become a real local celebrity and quickly start earning £100 for a two-hour shift. You’ll learn how professional quizmasters work smarter, not harder. And if a hundred pounds is not enough, I'll show you how to double or even treble that once you're up and running. This book is an Electronic Product. Delivery comes in the form of a download available immediately after completing payment. Full-time money on part time hours – Are you ready to be paid £100 for a night’s work? Confidence and Presentation Skills. Once you discover the tricks for wowing a quiz crowd, you’ll never fear any presentation again. Hours You Control. No last-minute shift-changes. Your quiz night happens at the same time every week and only lasts for 2 hours. It’s the kind of shift we all should be doing! New Friends. Quizmasters are at the centre of a great night out. Everyone's pleased to see you! The Freedom of self-employment. When you’re the quizmaster, you set the rules. Job Enjoyment. Never mind "job satisfaction". How many people can go all the way and say they actively enjoy going to work? Quizmasters are part of that rare club who love their work! Local Fame. When you get recognized by in the supermarket by your fans, that’s when the fun of being quizmaster really starts. You Won’t be as Famous as Brad Pitt but you won’t be hounded by the paparazzi either. It’s a happy medium! But don’t just take my word for it. There are 25,000 pub quizzes a week in the UK. Many others have already discovered what it’s like to make money and have fun as a pub quiz quizmaster. 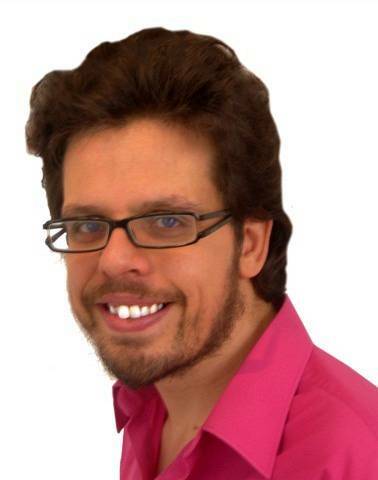 "From my 12-year experience in the pub quiz game and personally presenting more than 2000 live quiz nights, I'll reveal what works and what doesn’t. Learn from my mistakes, profit from my discoveries. Some quizmasters just work for beer but with 15 million people socialising in the nation's pubs every week and an estimated 25,000 weekly pub quizzes taking place in the UK alone, there is no doubt that there is a viable marketplace for a professional quizmaster. After helping other quizmasters get started in Glasgow, I realised that I should put my unique expertise in a book. There is no other book available that gives you step-by-step instructions on making a viable business from being a pub quizmaster. Who Would Make A Great Quizmaster? Becoming a Pub Quizmaster is a great job for anyone looking to make a great extra income from part-time hours, but there are certain groups who will get extra benefit. If you're looking for experience of presenting or performing, Quizmastering can give you plenty of that, as well as paying a nice extra income. Comedians - If you’re trying to break through as stand-up, working as a quizmaster gives you invaluable mic-time and a ready-made audience: an amazing opportunity to sharpen your style while getting paid proper money. Your fellow stand-ups will wonder how you suddenly became so relaxed and professional! Actors - Being a quizmaster gives you the ideal opportunity to build your experience of handling a live crowd. Presenting a weekly quiz could be your secret weapon! 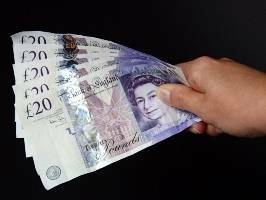 Students - Making a quick £100 on a Monday night as a quizmaster could be exactly what you need to get through the year without breaking the bank and still having time to study. DJs and Karaoke Presenters - If you get a lot of work on Fridays and Saturdays, but find the rest of the week slow, hosting Quiz Nights gives you a chance to put your skills to work on Sundays, Mondays, Tuesdays, Wednesdays and Thursdays too. Speakers - Anyone who wants to present for a living, be it in education, politics or business will gain irreplaceable experience from running a weekly quiz night... all at the same time as getting paid good money! To be at the centre of the reason everyone is there, and for them to choose to come along and want to be there - to do this every night is my enjoyable and enviable goal. You'll learn how the scene works and how you can quickly get started to become a local celebrity with your own set of fans and a tidy extra income. An introduction to quizmastering for money: including my own story and a look at the gap in the market for quizmasters and whether it’s the right job for you. How to find a pub that needs a quiz and how to sell them the night. How to round up a crowd for your quiz night, including tips on printing posters, using the internet to its maximum potential, and how to get free publicity. A detailed quizmaster’s-eye view description of my own quiz night format which kept Glasgow quizgoers entertained for 12 years. Almost every quiz night in Britain is different in some way. 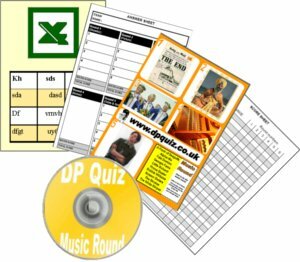 This part shows various ways that you can format and customise your pub quiz. Half of the secret to being a successful quizmaster is getting on top of problems before they arise. This module describes the organisation you need to make your quiz-life easy. Quiz like a pro. Learn the secrets that will leave your audience hanging on your every word and coming back every week. Why be just another quizmaster when you could be a quiz legend? This part is a step-by-step guide to actually presenting your quiz night and is packed with tips, tricks, shortcuts and know-how to help you be the best and keep your quizgoers coming back for more. £17.99 (inc VAT). Click to buy now. The aim is to make money, so you’ll need to know how to manage your affairs. 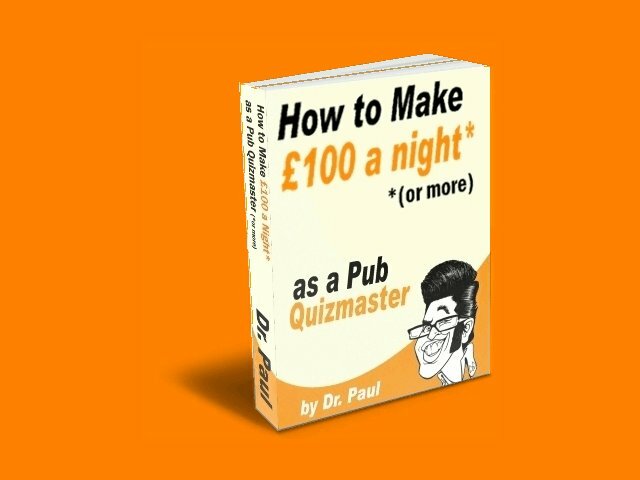 When you get How to Make £100 a Night (Or More) as a Pub Quiz Quizmaster, you also get the DP Quizmasters’ starter kit to make it easier than ever to get your quizmaster career started straight away. 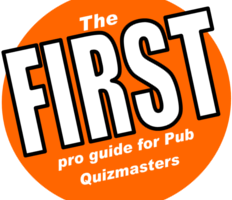 Starter Database of 100 Pub Quiz Questions. So why should I buy your book? You could go it alone and start from scratch like I did, but you’ll find it far easier after you've read about what works and what doesn't. Being a quizmaster is a brilliant way to make money but you need to know what you're doing. It took me years to work out the best ways to do things: how to sell a quiz in the first place, and how to negotiate a good price. I had to learn how to build an audience, how to develop a format for the quiz that keeps the audience coming back every week and how to write questions that work. Bottom line: I wish I’d had this book when I started out: it would have saved me a lot of time! "This is the book I wish I'd had when I was starting out as a Quizmaster." There’s never been a book on this subject before. Now you can learn from my mistakes and benefit from my easy instructions. This book gives you the shortcuts to 12 years or real-life knowledge and experience. You could start without it. But don't be one of the quizmasters out there who doesn’t know their own value. Some quizmasters are working too hard for too little pay because they don’t know the important shortcuts to a busy and successful night. £12.99 is a small one-off fee to when you think of how you’ll soon be pulling in £100 a night. £12.99 (inc VAT). Click to buy now. Until now, there simply hasn’t been a textbook for quizmasters, now there is! There is simply no other book like this available today. Quizmasters across the country are having fun and making easy money every week, but I’m the first to put it all down in a book and show you how to do it, step-by-step. I can’t wait to see you become a successful pub quiz quizmaster. FAQs: Still wondering if this is for you? If you're still not sure whether or nor or not you would enjoy being paid good money for speding your night in the pub, here are the answers to some questions you may have. Q. Don’t I need to spend money on lots of fancy equipment to get started? A. No. I’ll show you how it’s easy to get started with the absolute minimum of outlay on equipment. Q. Is there really a market for quizmasters? A. Yes. Every week in the UK, 15 million people visit the pub. There are 25,000 pub quizzes a week. The Independent newspaper describes Britain as “a nation of quiz addicts.” I made a full-time living from quizmastering. In fact, not only is there a market – but the lack of professional quizmasters means there is a big gap in the market. There is little competition; it’s an open goal. Q. Do I need to be a trivia whiz to be a quizmaster? A. No. Having a little bit of general knowledge will help but I’ll show you how to insure yourself against any quiz problems by asking watertight questions. And, at the end of the day - you're the one with the answer sheet! Q. Don’t I need to be funny? A. No. Some quizmasters are hilarious but as you’ll learn when you read the book, it’s far more important to be a warm person. Q. I’VE NEVER DONE THIS KIND OF THING BEFORE! A. Don’t Worry! My book is a genuine step-by-step guide. 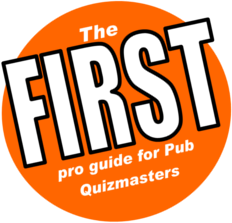 I am so confident that my book will quickly and easily get you on the road to pub quizmaster success, that I’m offering a full 30-day money back guarantee if you are not entirely satisfied with the book. That’s the Dr.Paul Guarantee and it means you can buy in complete confidence. We use Paypal to process transactions which means you can use any credit card – you don’t have to have a paypal account. The book is an electronic product and is delivered instantly as a download, within minutes of completing your transaction. The Dr Paul guarantee applies: if you are not fully satisfied with your purchase, let me know within 30 days and I’ll give you your money back – no questions asked! Thank you for reading this page. I hope you’re already excited at the prospect that you could soon be soaking up the applause and counting out the cash. As the credit crunch bites hard in 2009, pubs up and down the country are fighting for their lives. At some pubs, the windows have already been boarded up and more will close. The ones that survive and thrive will be the ones who take real action to attract customers. This action includes putting on a pub quiz. 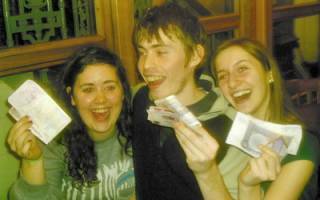 Believe it or not, the recession is a boom time for quizmasters. Order the book now and learn how to approach them… before they close. You could even save your local pub before it goes to the wall! Matthew Deane, Mitchells & Butlers. PPPS: This is the first ever book specifically written with all the detail on exactly how you can become a pub quizmaster. Get in now before someone else in your area snaps up all the pubs!